Moving day is approaching fast! The stack of packed boxes in the passage is growing slowly. I have taken most of the pictures off the walls, so the house is definitely feeling less like our home. Some of the kids’ toys are also packed. I thought I kept their favourites out, but you know what kids are like; one week this toy is their favourite, the next week it is a different one. 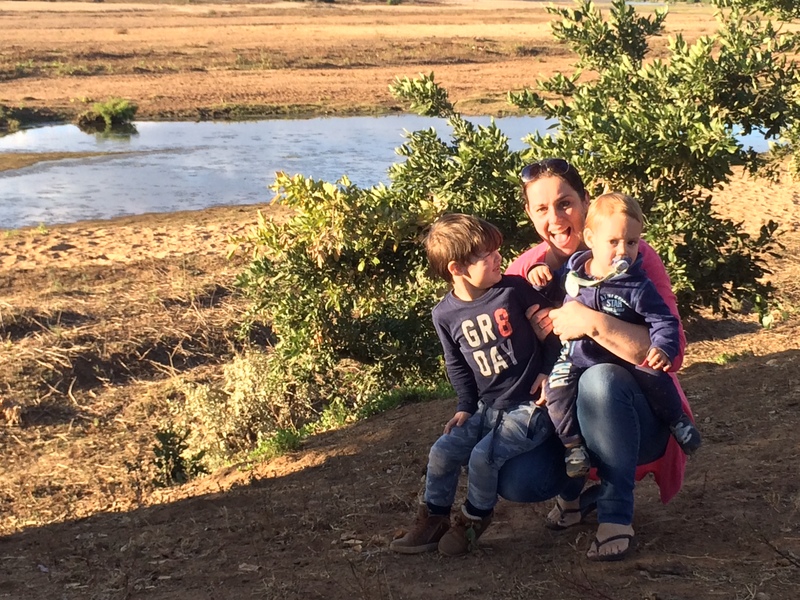 Well, apparently I packed their favourites of this week, so we went for a few extra drives;-) Also because I want to soak up every ounce of Letaba before we move! Late one afternoon we were on our way to the Letaba high water bridge when we saw a flock of guinea fowl in the road. Both Alex and Jack were completely mesmerised. I opened the windows for them to hear their tchrrrrrrrr sounds. Alex leaned out and shouted: “Hallo kip! !” (Hello chicken!) Well this sent the birds in a flat spin running down the road. I had to giggle. Have you ever noticed how they look like miniature dinosaurs when they run like that? Alex was beside himself. He could not stop laughing! Which in return had both Jack and me in stitches. It is amazing how things that aren’t all that interesting to us adults, can completely fascinate children! Every afternoon now Alex is asking to go see the ‘chickens’. So with the house in Malelane almost finished, our ‘farewell tour’ is in full swing. We have been to the bridge over the Letaba a few times. Where the boys like to throw sand into a puddle of water at the bottom. And I just like to watch the sunset and the elephants that come to the water to drink. We also took a lovely walk through the rest camp. Alex was chasing birds around yelling ‘come here kip’ to doves and francolins alike. He is such a bush child! There was a lone elephant drinking from the river. Man, I am going to miss that view from the restaurant. It truly is one of a kind and together with the view from Olifants rest camp, my favourite in the park. But the best part of the ‘farewell tour’ is the sundowners we had on the river. One afternoon the boys and I went with our neighbours to a special spot where the Nhlanganini stream flows into the Letaba River. On our way there, we encoutered two sparring bull elephants. There is such power in those animals! We call them gentle giants, but during a full-blown fight there is nothing gentle about them! The sound of their ivory clashing together was quite intimidating! Alex and his stick. Bushchild! This place on the river is my neighbours favourite and I totally get why. The view of the river is stunning with a little sand bank to the right and the Nhlanganini stream behind you. A beautiful Apple Leaf tree frames the view and provides a bit of shade. We sat down in our camping chairs and watched as three stunning waterbuck rams crossed the river. There were elephants on the opposite bank, feeding contently on the Mopani trees. And to top it all off, we could hear a fish eagle call a few times; that special sound which is so typical for the bush. It was such a lovely and peaceful afternoon. As the sun started going down, a flock of guinea fowl came walking down the road towards us. The Apple Leaf we were sitting under was probably their roosting spot for the night and we were in their way! Alex could not believe his luck: a whole flock of his favourite ‘chickens’ right there to chase around! The birds were obviously not amused and flew up in their tree, sending down a few indignant looks. The sun was setting quickly now, giving the sky a beautiful orange glow, as she dipped below the horizon. The sunsets here in Kruger is something I can keep watching in amazement over and over again. It is a stunning spectacle that is different each and every day! The first part of ‘Farewell Letaba’ is also online. You can read it here. What animals walk around the staff village at night…? Beautiful descriptions of your farewell activities Linda. The sundowner in the shade of the Apple-leaf sounds idyllic. It seems as though you are very well-organised in terms of being ready to move – I don’t envy you that task – with the pictures and favourite things gradually disappearing into boxes, the house becomes a bit bleak and bare (and crowded box-wise) which is when I get to the stage of wishing it were all over and I was unpacked and settled in my new place! Beautiful description of your various leaving activities Linda. The sundowners in the shade of the Apple tree sound idyllic. You seem very well-organised in terms of packing up but it must be a little sad to be living in a house that you are going to leave and now feels rather empty. I know this is the stage where I start wishing the whole process were over and i was settled in the new place! Hope the rest of the moving plans go well. Hahaha, so sorry about that Sal! When I get a comment from someone that has not commented before, I have to moderate and approve first before the comment appears on the blog. I believe it is a spam filter or something like that! LOL! Computers! Who’d be without them? Again – another lovely read. Thanks again for sharing your experiences with us. Greetings out of a surprisingly hot and humid Holland. I did not know it could get so hot here. We are experiencing strange winter weather here. With the occasional rain! It is not supposed to rain until October, November! Lovely read again Linda, enjoy your farewell tour, farewell is never goodbye, you will be back. So sorry you will not be there when we go camping next year May. We will be staying at Letaba for a week but we are doing the entire length of Kruger in 6 weeks. Thanx again for your lovely blog. I’m really enjoying it. 6 weeks in Kruger is such a nice long time! You must be really looking forward to it already!! “Hallo Kip” that’s so funny, reminds me of my children when they where young, Linda, you will make new memories in Malelane and Berg-en-dal. To Alex, every bird is now a ‘kip’! Yes, I am looking forward to starting this new chapter in our lives! I only recently came across your blog through Facebook and am thoroughly enjoying it. I was in a long term relationship with an amazing man who has recently qualified as a field guide and will be doing his orientation in Kruger in October. We both love the bush, but I understand your feeling of isolation, I am very much a peoples person and although I enjoy my Kruger trips, I can’t deny that I am always happy to return to civilization. Just to put you in the picture, I am from Fish Hoek in Cape Town, so home is where the beach is 😉 I haven’t been as far up as Letaba, I camped in Satara last year, but think my favourite camp has to be Lower Sabie (well of the camps I have been to thus far). We did a bush walk last September and I must say that nothing beats being out there in the bush – such freedom, you almost feel whole. Any way, just thought that I would say hello and wish you luck with your move and settling in. Life is such a journey, and your boys will be lucky to have your blog to look back on. Perhaps we will cross paths next time i am in the park. Yes, it can be a bit isolated here, but luckily I am connecting with people through my blog now! It is the best thing I have ever done! Cape Town is my favorite place on the planet! And believe me, I have been pretty much everywhere as a cabin attendant;-)! Fish Hoek is such a quaint little town, with amazing restaurants! I have not been there in way too long! So I think you are very blessed to be living there! Something about the grass being greener somewhere else? Walking in the bush is the best way to experience this wilderness we live in! I would recommend every visitor that is physically able, to do one of those walks. Or a trail! Have a lovely day there, and who knows we might see each other when you are here!